I've been using Ebates for over seven years and love to get rebates back whenever I can. Here's a screenshot of my personal earnings for one quarter. Maybe you've heard of Ebates and aren't sure what it is, how it works, or how to use it. I recommend learning all about it before making purchases, or you could miss out on having your purchases tracked for cash back. I've used this website for over seven years, and I want to share with you what I've learned over the years. 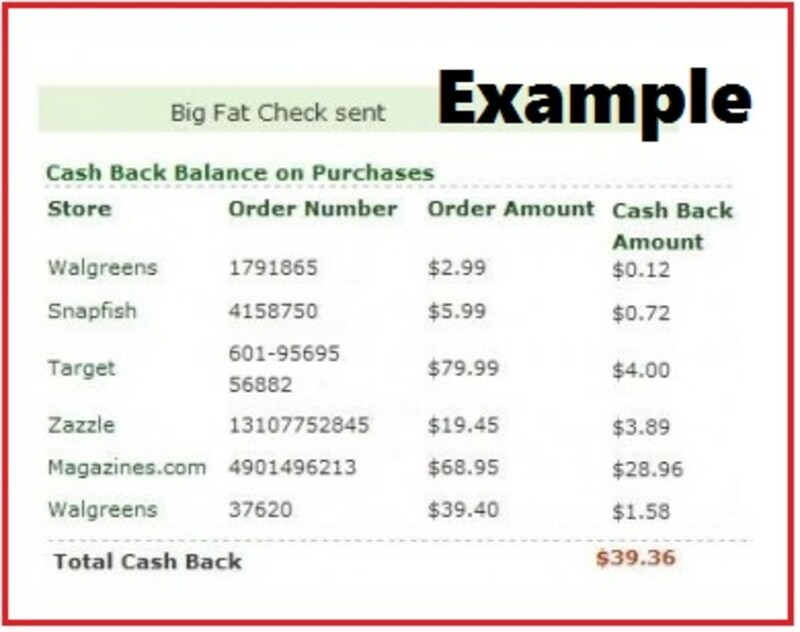 Ebates is a free program that lets you earn cash back on internet purchases. You sign up, click on a link to your favorite store, and make a purchase. Ebates then puts a percentage of that purchase into your Ebates account. They will mail you a check three times a year. I share step-by-step instructions on how to make a purchase further down in the article. Here's a quick version of how to use Ebates. Sign up with Ebates. It'll ask for your email, name, etc. It will also ask you to pick a gift card for signing up. (Disclaimer: If you sign up through this link, I'll earn a small commission—and so will you. I have no other affiliation with the company). When you're ready to shop online, go to Ebates first and click on the link to your favorite store. Don't leave your online store until you have made your purchase! I'll explain this in more detail later. Shop and check out as usual. That's all! FYI: Ebates tracks your purchase. This all takes place in the background. You will not see any notice that your purchase was tracked. Don't worry! It did happen, and you will see money from your purchase in your Ebates account in a few days. Is it some sort of scam? Yes, I do. I use it often, although I have to say that most people look at me with one eye squinted when I tell them about it. I know they are thinking, "How can this be real?" I thought the exact same thing. 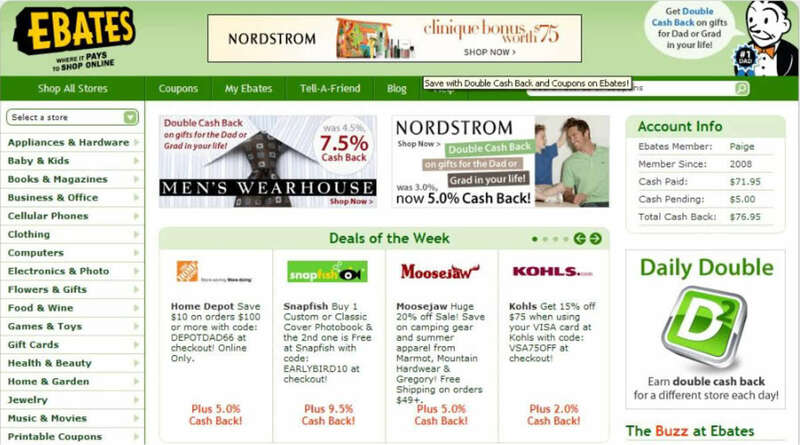 How can Ebates offer cash back on purchases? Aren't they just giving away money? This was my first question, and now that I know more about internet marketing, it all makes perfect sense. Think of the internet as a huge marketplace. Every purchase has a click path that was followed to make that purchase. Frequently, the site you click from earns a commission for the referring site. Well, some smart folks had an amazing idea. Why not offer a large selection of links that earn commission and share the commission with the people making the purchases? Enter Ebates. 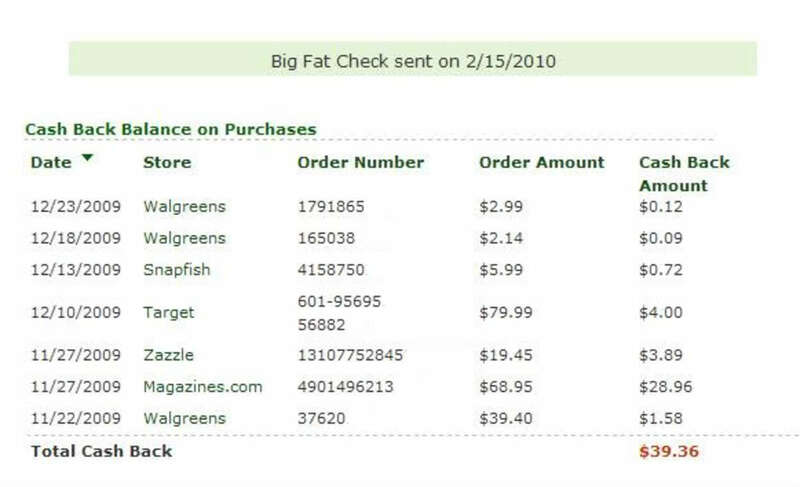 Do you get a discount at checkout by simply clicking through Ebates? No. You will not get a discount from the store you're shopping at simply by clicking through Ebates. 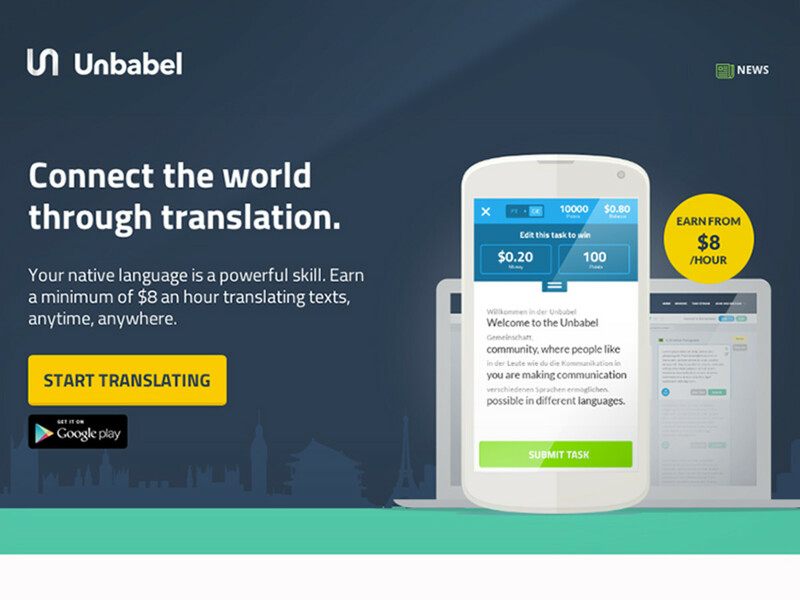 You will earn a percentage back into your Ebates account. 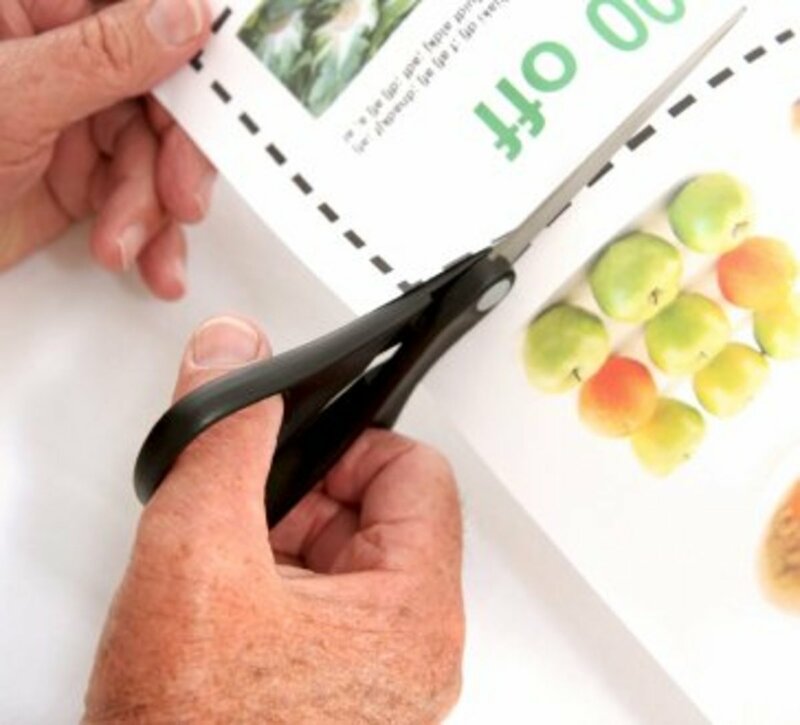 It's important to note here that you may be able to save additional money on purchases with coupon codes. Can you use coupon codes while using Ebates? Yes. I've seen some disclaimers about a select few sites that have rules about combining offers, but I've never had this happen. As a matter of fact, Ebates offers its own coupon codes. How do you get the money you've earned? Ebates sends out checks three times a year to its members who have earned $5 or more. If you earn less than $5, your money will stay in your account until you break the $5 threshold. 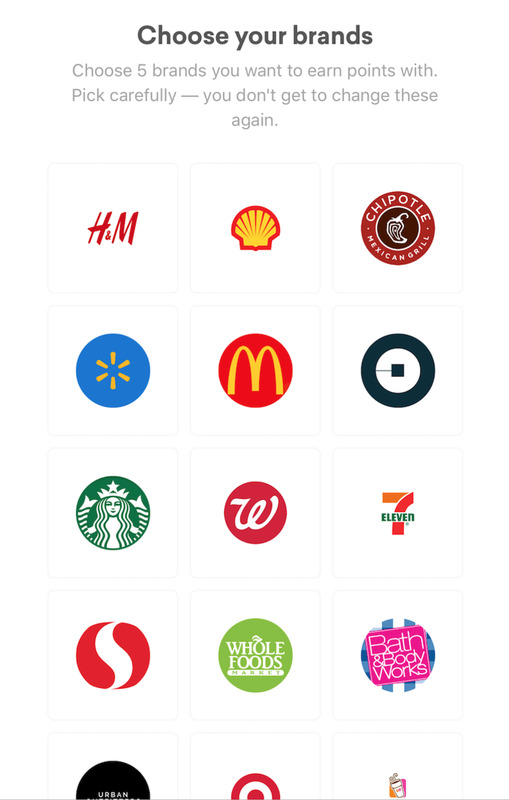 Which store links have you earned cash back from? Here are a few I use regularly: Walgreens, Foster & Smith, Magazines, Target, Snapfish, eBay, and more. Does Ebates Link to Amazon? Yes, they do (for select categories). What happens if I forget to click through Ebates? Will I still get cash back? No. Don't forget to click through Ebates. What if I click through Ebates to make a purchase—Walmart, for example—but get distracted and visit another site. If I return to Walmart to check out, will I still get cash back? No. Do not navigate away from your purchase before you complete the transaction. Otherwise, your cash back will be lost. Why are you telling me about this cash back service? Because I am a rebate woman (according to my family anyway), and I don't see a reason why anyone would not use this cashback tool to earn a little cash for themselves and their families. How long have you used this website? I've been using it for over 7 years. When is the best time to use Ebates? I always use it for online purchases, but the very best time is around Christmas. Do not miss the double cash back deals at that time! 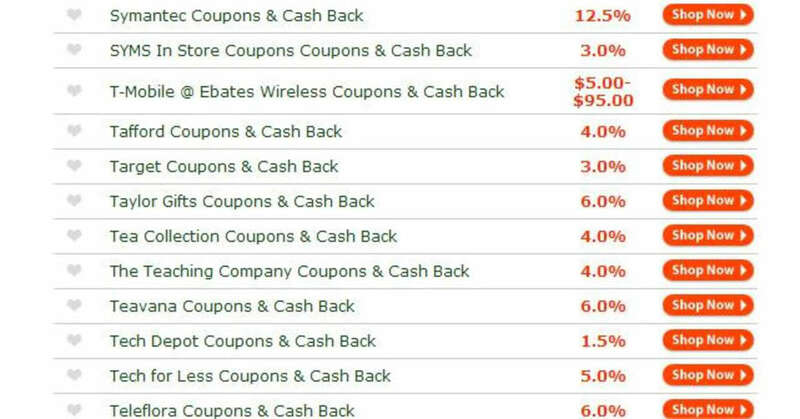 Ebates will send you emails about exactly which days are double cash back. What's the best deal you've gotten through Ebates? Each year, I purchase a magazine subscription for my uncle. He used to live in Alaska, so he loves to receive the Alaska Magazine. The regular price was $18.00/yr at my favorite online discount magazine website. For the best deal possible, I waited for the double cash back day (I think it was on Black Friday last year), clicked through Ebates, and earned 42% back! Not only that, since I had ordered from them before, the magazine website had recently sent me a $5 off coupon for any magazine purchase. So, all in all, I paid $7.54/yr when I factored in the cash back. When Can I Expect a Payment From Ebates? Here are your options for payment methods. Remember to specify which method you want to use when you sign up. 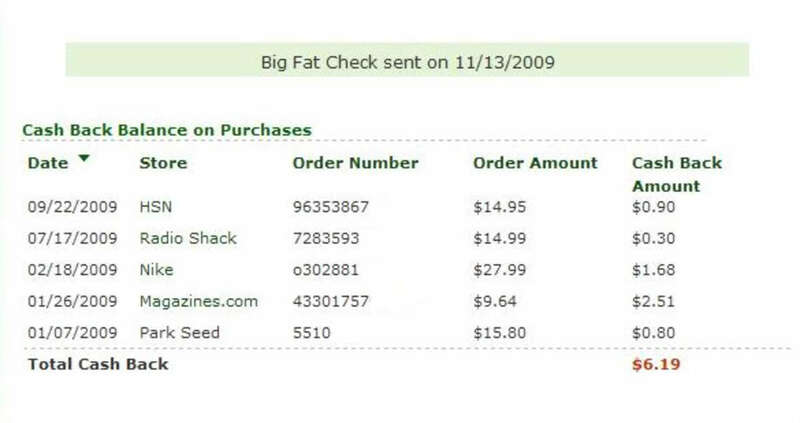 I used to receive my earned cash back in the form of a Big Fat Check (that's what Ebates calls it). However, I changed it to PayPal, and all transactions have been smooth and on time. I didn't realize PayPal was an option until I wrote this article. Below is a copy of one of the checks I've received. This check was a smaller amount of $6.19. It does not include any Christmastime spending. Take a look at my purchases in the next section to get an idea of what to expect. 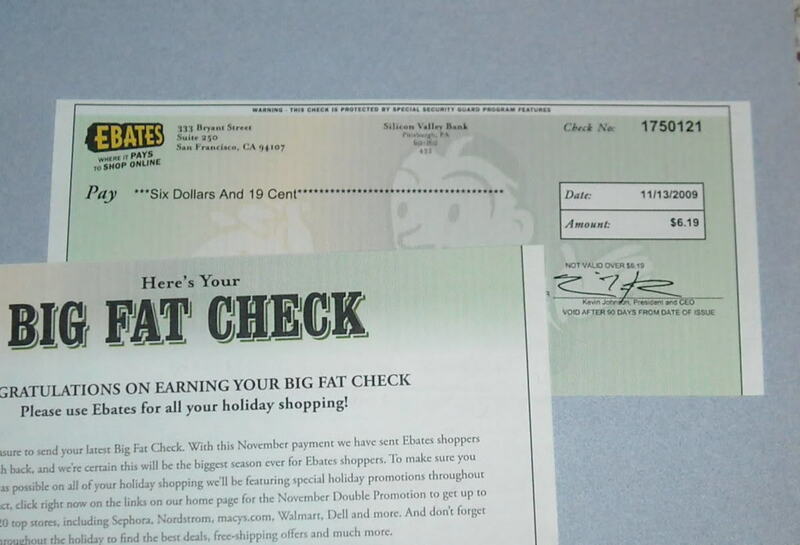 Here is a copy of a check I've received from Ebates. Here is a screenshot of one of my payouts. It took me awhile to get to the $5.00 threshold for this payout. This payout example included my Christmastime spending, which adds up fast. 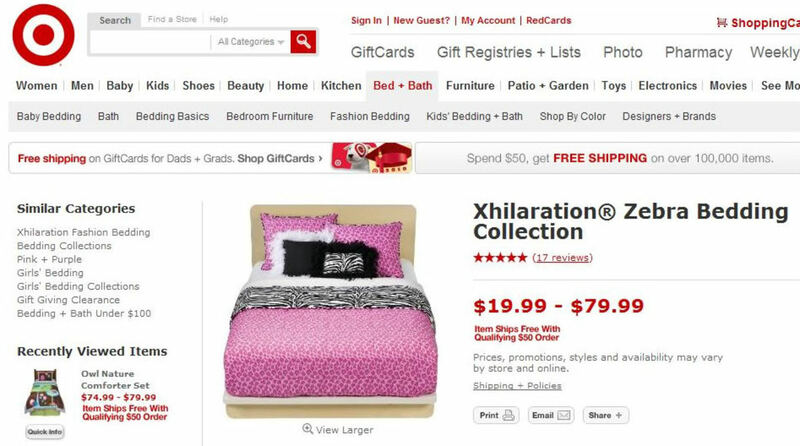 Scenario: I need to purchase a comforter set from Target. The photo below shows what the homepage will look like after you sign up. You must click on a link through Ebates to earn cash back. First, I have to find out if Target is indeed one of the store links at Ebates. Go to Ebates and click on "shop all stores" in the upper left corner. Since stores are listed in alphabetical order, click on the "T" to see if Target is listed. Yes! It is currently at 3% cash back. Step #3: Click "Shop Now"
Go ahead and click on the orange "shop now" button (as seen in the photo above). A new page will load (as seen in the photo below) to let you know you'll be getting cash back on your purchase. Now that you're on the Target website, do NOT navigate away from it until you make your purchase. 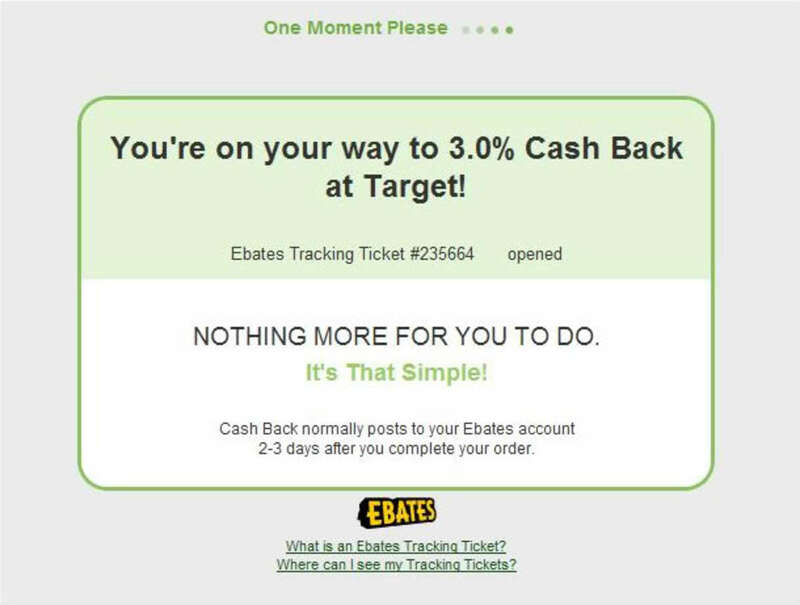 Target will not alert you to any cash back with Ebates, even though it will happen when you check out. However, in a couple of days, Ebates will send you an email about money being credited to your Ebates account. Be on the lookout for an email notifying you of the cash back you have earned. This usually takes 2-3 days. 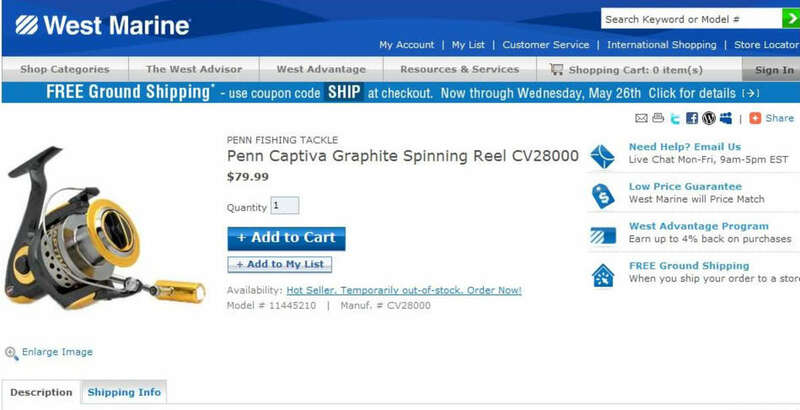 Scenario: I want to purchase a fishing reel from West Marine for my husband. The photo below shows what the homepage looks like after you sign up. First, I have to find out if West Marine is indeed one of the store links at Ebates. Go to Ebates, and click on "shop all stores" in the upper left corner. Since stores are listed in alphabetical order, click on the "W" to see if West Marine is listed. Yes, it's there! Do you see it on the list? See the orange "shop now" button to the right? Don't click on it yet! We need to sweeten the deal first. 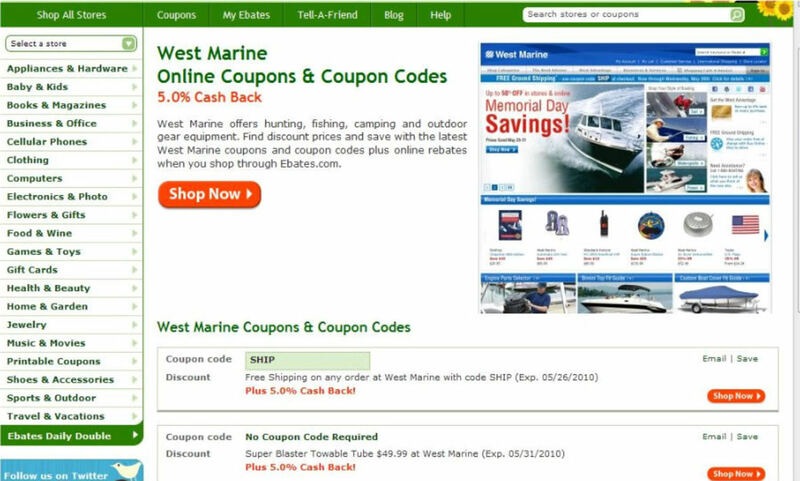 Click on "West Marine coupons & cash back" (in green lettering). 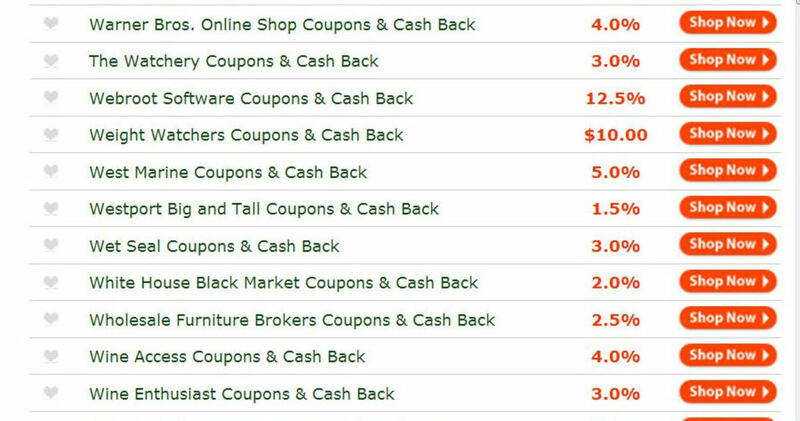 When you click on "West Marine coupons & cash back" it takes you to the page seen in the photo below. Browse all of the offers available. Some will say "no code needed," but others will offer a special code you will enter at checkout to receive a discount. If you look closely at the West Marine page below, you will see one of the codes available when I wrote this article was "free shipping" with the code "ship." But wait! You may be able to find an even better code somewhere else online. If you find a better code somewhere else, simply write it down and come back to this page and close those other computer windows you used while searching. You don't want to miss out on the cash back! For this particular purchase, I found $5.00 off a $50.00 purchase elsewhere online, and I'm going to use it. Once you have written down your coupon code, it's finally time to click "shop now." You'll arrive at the page seen in the image below. This page lets you know you're on your way to cash back with your purchase. Now that you're at West Marine, do NOT navigate away from it until you make my purchase. The reel my husband is interested in is priced at $79.99. 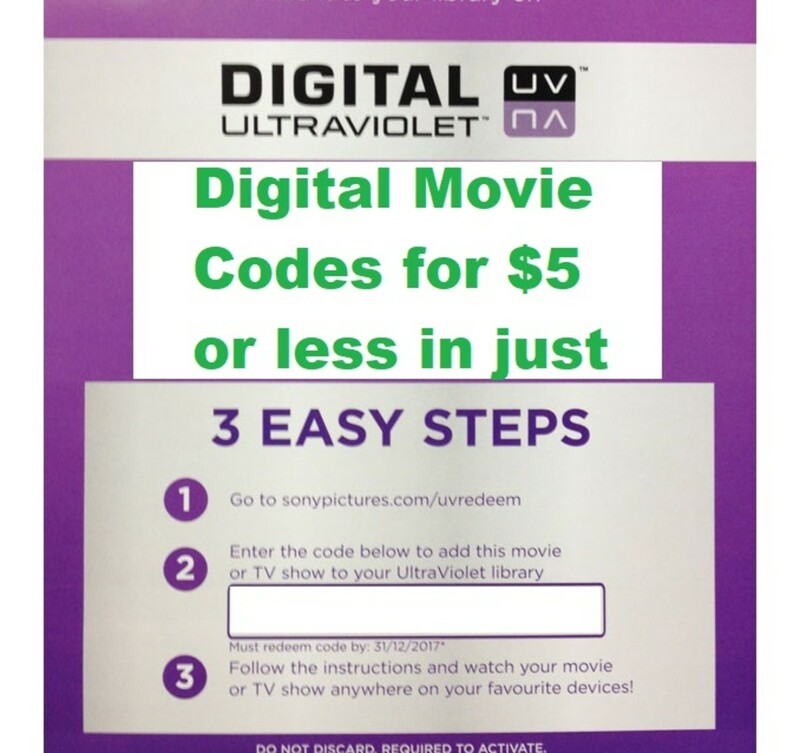 When I check out, I use that coupon code of $5 off $50. I make the purchase with my coupon codes and pay with a debit/credit card. 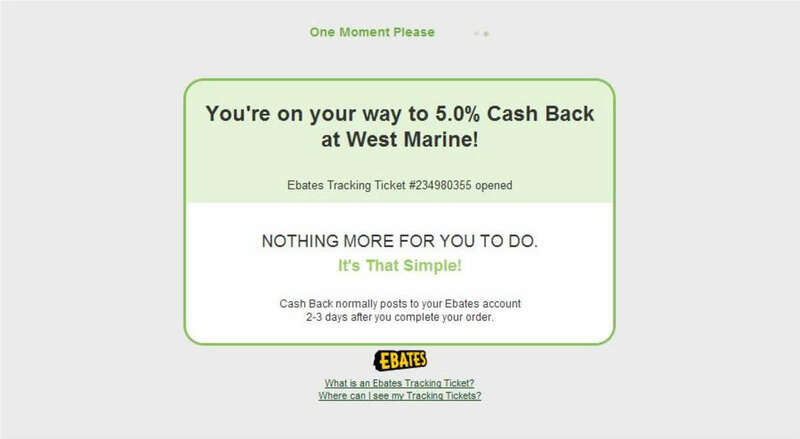 West Marine will not alert you to any cash back with Ebates, even though it happened when you checked out. However, in a couple of days, Ebates will send you an email about money being credited to your Ebates account. *The photo below is actually from Target, but Ebates will send you a similar email for all purchases. After Reading the Information Above, How Do You Feel About Ebates? You've convinced me. I'm going to sign up and earn some cash back. I see all of the information you've provided, and I'm interested. I'm looking at you with one eye squinted. I'm not quite convinced yet. I've seen all of the examples, but I still don't believe it. No one can earn cash back online. Don't Forget to Use This Awesome Cash Back Service! Use it for Walgreens photo print orders, use it for all your pet supply purchases, and all your gift giving and Christmas shopping. Earn some fun money for yourself. I shop a lot at Walmart, do I get cash back on every purchase through eBates or just on certain items? All purchases. If there IS an exclusion, it will be listed on Ebates. The only store that seems to limit is Amazon. For example, Amazon may offer cash back on clothing but not electronics. I haven’t seen limits from other stores. How do I find out if the stores I frequent are a part of Ebates? There is a search feature on Ebates, and it's very easy to use, although I’m not sure if you can see the list before signing up. If you want to know before you sign up, you might be able to simply Google the store and the word "Ebates" and possibly get an answer that way. I’ve come across one or two that aren’t on Ebates, but not many. Is there a minimum amount that I have to spend each month to receive Ebates? Not at all. There is no minimum and no maximum. Does Ebates work with Royal Caribbean, and if so, what percentage do the give? What if I forget to click through Ebates, but then I remember before checking out? Thanks for Stopping By! Do You Have Any Questions About Ebates? Well this was good timing. My wife had just stumbled upon a mention of Ebates yesterday and has been talking about it. I just told her about this article and she is going to read it when she gets out of the shower. Great explanation-now I will start using Ebates! I can't figure out how to change my ebate to paypal instead of big fat check. Can you walk me through it? Is the price tag of ebates is same as that of real outlet Walmart,Jpenny etc. Ebates is a great site, yes it absolutely is. In fact, you have given a very thorough definition and description of it here. I am glad to have found your article and I do appreciate your writing. Ebates is a good way to get some money back. I have a question how are you earning money if you only get a percentage if someone goes shopping after your review? How do you make money if you buy something for $500.00 and only get 5.01? So in reality you are losing lots more money than you are making! I LOVE EBATES IT IS THE BEST WAY TO SHOP ONLINE AND GET DISCOUNTS AND CASH FOR SHOPPING! @anonymous: I opted to get my payments via paypal, but before that did get them mailed to me. I don't recall there being a long time lag. Seems like it wasn't a very long time. How long does it approx take from the time the checks says it has been sent til the time it arrives in the mail? When Ebates says "No Discount" on whatever site it may be I want to shop on. What exactly do they mean? Or does it mean exactly what it says? Thanks. I just joined ebates not to long ago! I wish I would have went through you! I am definitely bookmarking and sharing on Facebook! @anonymous: I've been thinking about your question a bit more. And want to add more info. SOME stores are now offering a "Pick up in store" option. This is where you make your purchase online, then actually go to the store IN PERSON to pick up the item. No shipping involved. This is an instance when you MAY be able to earn cash back and still pick up the item right away in store. BUT, let me say, I'm not 100% sure on this. I will test it with a local store and post the results here. If anyone else gives this a try, please post your results so we will all know. Thanks!!! @anonymous: Well that depends on the store you are buying *from*. Let's say you are buying from Kmart. 1) Go to Ebates 2) Click on the Kmart link 3) Select what you want to buy at Kmart 4) When you check out at Kmart, look for a PayPal payment option. (I have no idea if Kmart allows payment from PayPal, this is just an example.) If you see it, then yes, you can use it. In a nutshell, it all depends on the site you are buying from, not Ebates at all. Very good question. Thank you! Hey Can I use Paypal as a payment option on ebates? @anonymous: I'm not familiar with this. Best thing to do is call ebates or send them an email. I've had good luck with emails to them - their responses are always quick. Question: Is Ebates only for online purchases? I don't like to shop online, I make in-store purchases. So can I still use Ebates? Not a silly question. But, no, you don't get the $ back you spent, only a percentage. So if you spend $10.00 on a shirt (through ebates) and that store is offering 3% cash back, you will earn $.30 into your account. For $100 you would earn $3 etc. etc. Every little bit adds up. Silly question maybe but I'm just wondering if this means that I get the money back I spent plus the percentage? @anonymous: Thanks Michelle! I am looking forward to my Christmas Big Fat Check too. I even ordered some things for my mom through my acct. Should be a nice one. I use ebates but had some questions about it that the sight its self was not answering. This answered all my questions and also gave me some great tips.. can't wait to get my big fat check... I already have 27.31 from christmas shoping and I just signed up in november! Wish they would add amazon! Well wow-weee! You've done quite a presentation that is quite convincing. thanks for explaining it so well! I will use it for sure.